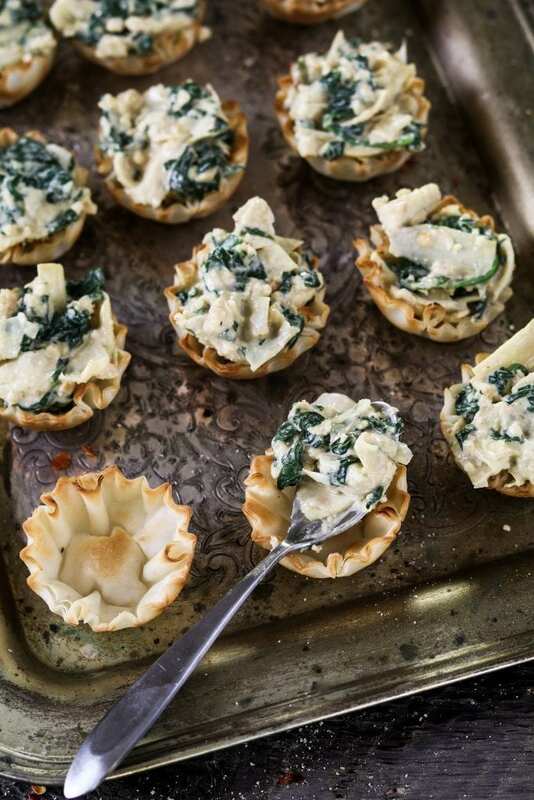 Vegan Spinach Artichoke Cups ~ a crowd favorite tucked inside a crispy and flaky shell. Hey guys! 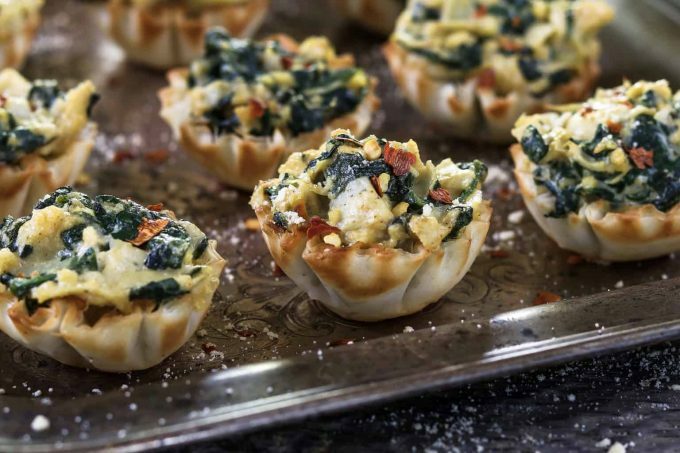 New Year’s Eve is just a few days away, so I want to share these Spinach Artichoke Cups to help you celebrate. You’ll just need to stop at your local grocery store and pick up these cute little pre-made phyllo shells (a.k.a. fillo or filo). You can find them in the freezer section near the desserts and pie crusts. Most places carry them and I even saw them at Walmart and Target just recently. They are a few dollars more than regular phyllo dough, but so worth it. You won’t have to worry about the dough drying up and cracking apart. Just fill and bake! Make sure to thaw out your spinach and squeeze out the excess water. You can use fresh spinach if preferred, just cook it down to about 1 cup. Make sure the liquid is drained as well. Now finely chop and add to a large mixing bowl. Now rinse the canned artichoke hearts and drain really well (to avoid a watery dip). Finely chop them and add to the large mixing bowl. Add the vegan mayonnaise, vegan cream cheese, lemon juice, breadcrumbs, nutritional yeast, garlic powder, onion powder, paprika, crushed red pepper, salt, and pepper. Combine well. 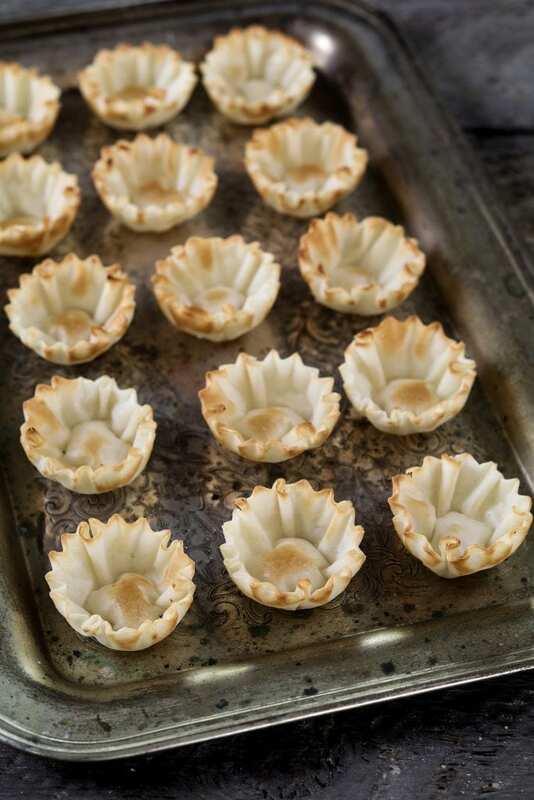 Fill the mini phyllo shells using a small spoon and place each one on a large baking tray. Top with some vegan parmesan cheese, or shredded vegan cheese if desired. Place in preheated oven and bake for 10-12 minutes at 375° F (190° C). Bake until filling is heated throughout. Serve immediately. Sprinkle with more vegan parmesan if desired. Voila! You’ve just made a super-easy, tasty and elegant appetizer! Now watch them disappear in under 10 minutes! You may want to make a double batch. 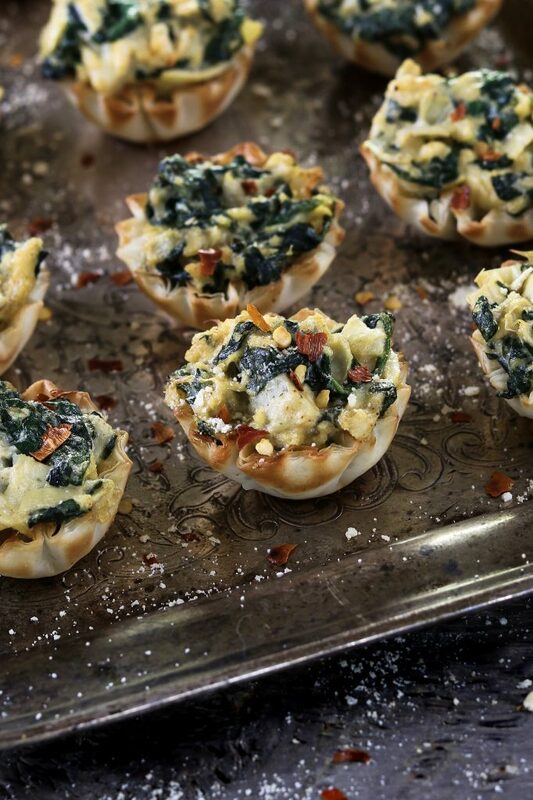 You can make these Spinach Artichoke Cups ahead of time too. Just make the dip the 1-2 days before and place in an airtight container. Store in the fridge. When ready, just fill up the frozen fillo shells and bake as usual. They freeze really well too. Just fill up the fillo shells and place them back in the trays they came in. Once frozen, they can be stored in an airtight container. Freeze for 2-3 months. Baking time may need to be increased by 5-10 minutes. 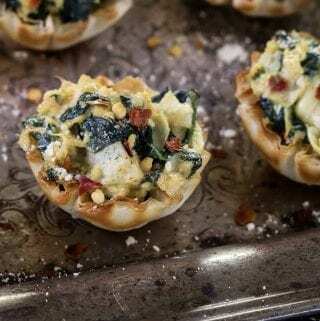 If you make these Spinach Artichoke Cups, I’d love to hear what you think in the comment section below. It would really make my day. You can also follow me on Instagram and share your creation with me. Just tag me @veganhuggs and hashtag #veganhuggs so I don’t miss it. 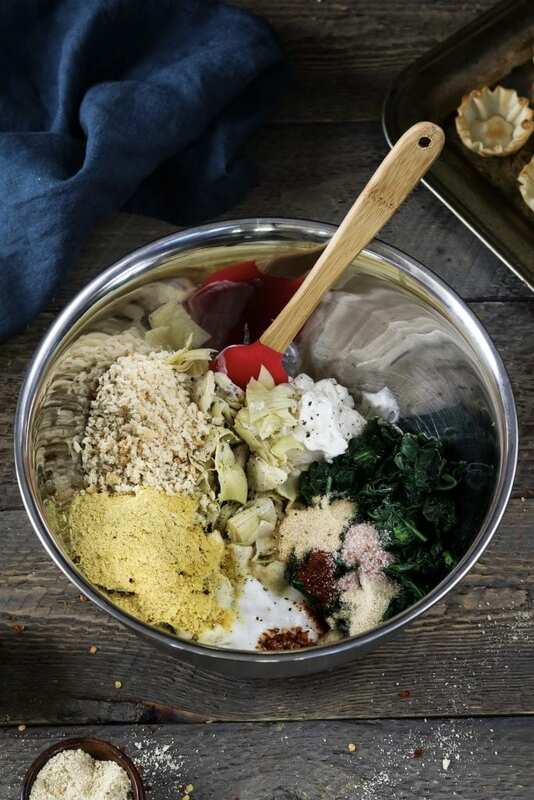 To a large mixing bowl, add the spinach, artichoke hearts, mayonnaise, cream cheese, lemon juice, breadcrumbs, nutritional yeast, garlic, onion, paprika, crushed red pepper, salt, and pepper. Combine well. Taste for seasoning and add as needed. Fill the mini phyllo shells using a small spoon. Place each one on a large baking tray. Place in the oven and bake for 10-12 minutes, until filling is heated throughout. Serve immediately. Sprinkle with vegan parmesan if desired. *Prep time doesn't include thawing time. *Make ahead: make the dip the 1-2 days before and place in an airtight container. Store in the fridge. When ready, just fill up the frozen fillo shells and bake as usual. *Freeze: Fill up the fillo shells and place them back in the trays they came in. Once frozen, they can be stored in an airtight container. Freeze for 2-3 months. Baking time may need to be increased by 5-10 minutes. * The amount of spinach going into the bowl should be about 1 cup (a little more is fine). This is after it has been thawed and squeezed of excess water. If you use fresh spinach, just cook it down to that amount as well. * For an extra kick, add 1/2 teaspoon of ground cumin. Can fresh garlic be used in these, and if so, how much? Hi Cindy, you can use it, but the garlic might be more prominent since it’s going in raw. If you love garlic, then it will be perfect though.I would use 1-2 small cloves. Made these for Thanksgiving – they were outstanding!!! Tasted just like the dairy laden Pampered Chef spinach and artichoke dip recipe! Even my picky non-vegan mother loved them! I made these for my coworkers to inspire them to eat more vegan food. No one even questioned their taste. They loved them and begged me to bring in more. Had a small gathering last night with vegan friends attending. 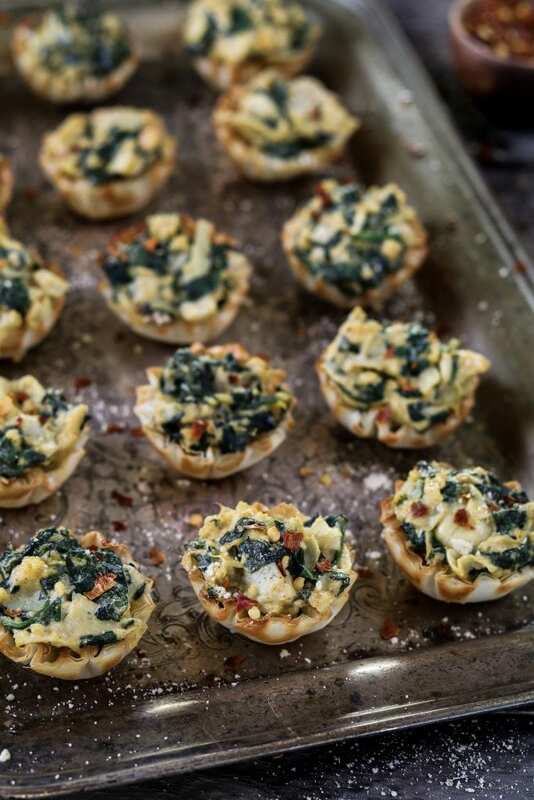 The spinach artichoke cups were a hit and so easy to make ahead and freeze. Please specify the amount of garlic powder. Mine came out a little heavy on garlic. Would this recipe bake like a regular dip if I wasn’t to use the Phyllo cups. I am attending a party this weekend and I wanted to make something I can eat and love Spinach and Artichoke Dip. 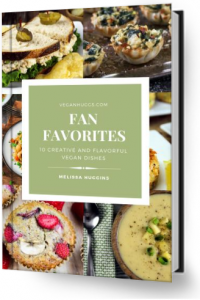 I notice that you also have another recipe for a spinach dip but this one seems more like the real thing with vegan mayo and cream cheese in it vs the other recipe that had vegan yogurt, which i have a hard time finding the unsweetened variety in my stores. Melissa, I made this dip for my party and it was a hit! I did add breadcrumbs and nutritional yeast on top before baking it. The non-vegans loved the dip and I should have made a 2nd because the one I made was gone. Hi Melissa, I will make this for my romantic New Year’s eve dinner. I do not have kids and my mom and sisters stayed in Peru after the weeding we attended on Dec 1st I made your crabless cakes on Christmas eve and Success !! I did not have Worcestershire sauce so I follow yur advise and add Tamari…delicious but I I really like them with Worcestershire sauce…well I can’t attached pics of the cakes but believe me they love them..thanks Happy New Year!